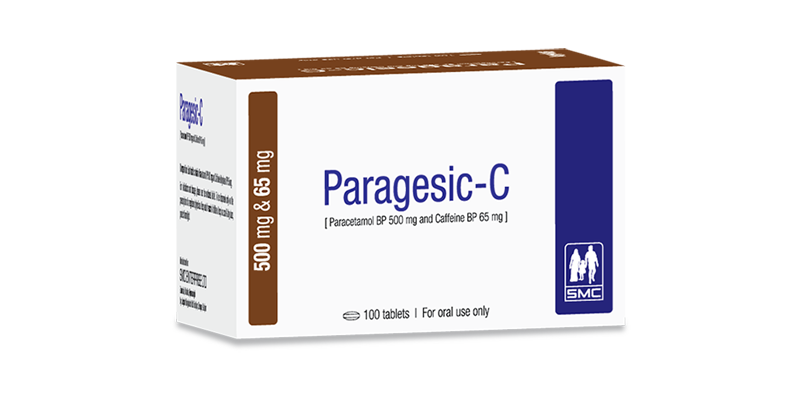 Paragesic-C tablet: Each tablet contains Paracetamol BP 500 mg and Caffeine Anhydrous BP 65 mg.
Paragesic-C is a combination of Paracetamol and Caffeine which is one of the safest and most widely used analgesic and antipyretic. Paragesic-C produces analgesic action by elevation of pain threshold and antipyresis through action on the hypothalamic heat regulating center. Paragesic-C exerts significantly milder side effects and most unlikely to produce many of the side effects associated with Aspirin and NSAIDs. Paracetamol is rapidly and completely absorbed from the GIT following oral administration. The drug is extensively metabolized in liver and it has plasma half life of 1.5 to 3.0 hours. Paracetamol is not bound to plasma proteins to any extent. Adults & Elderly: 1-2 tablets three to four times daily. Do not exceed 8 tablets in 24 hours. Pregnancy: Paracetamol is safe in all stages of pregnancy and lactation. Lactation: Paracetamol and caffeine are excreted in breast milk, so caution should be exercised when administered to a nursing woman. Liver damage may become apparent 12-48 hours after ingestion. In severe poisoning hepatic failure may progress to encephalopathy, coma and death. Paragesic-C tablet: Box containing 10 x 10’s tablet in blister pack.